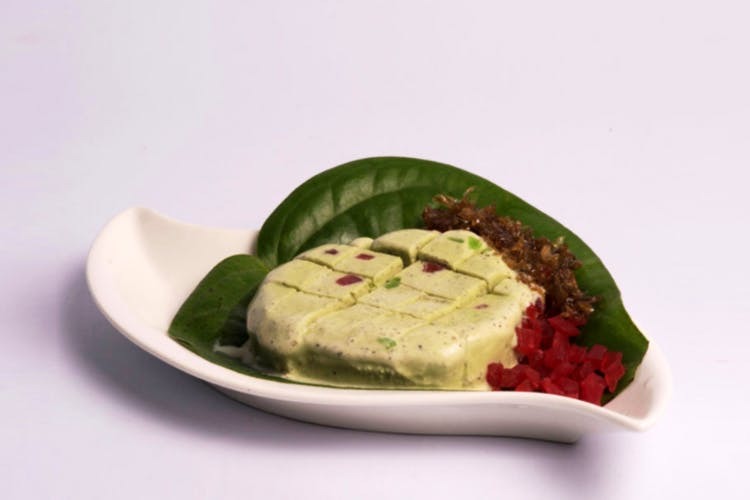 But first let me take a kulfi, because there’s just so many flavours to choose from at Bombay Kulfi! The small air-conditioned outlet in Bessy has fun quirky wall art and is reminiscent of a modernised kulfi stall from the streets of Bombay. We love, love, love the variety! There are fruit flavours like Mango, Chikoo, Tender Coconut (velvety with coconut kernels in it) and Guava (they even add some salt and chilli powder to this one, just the way we like it!). You can ask for kulfi sticks or slices. We tried the Jelly Belly (INR 70 for a plate) — soft vanilla kulfi with chunks of jelly that had a nice little zing to it. There’s also desi flavours like Kesar Pista, Shahi Gulab which are really fragrant and leave a very pleasant aftertaste. As for the chocoholics, you can dig into their Oreo and choco chip kulfis for a decadent indulgence. Go with a large group of friends so you can taste all this delish stuff and more!